Corel has launched PaintShop Pro X9, the latest version of its photo editing software. With the X9 version, PaintShop Pro adds seven new features, as well as two enhancements to existing features, including new Interactive Gradients, expanded RAW camera profile support, and new Project Templates. Joining this release is PaintShop Pro X9 Ultimate, which includes the X9 software plus an add-ons collection with AfterShot 3, Corel Live Screen Capture and Athentech’s Perfectly Clear 2 SE. PaintShop Pro X9 is available now for $79.99 USD/CAN, 69.99 EUR, £59.99, and $99 AUD. 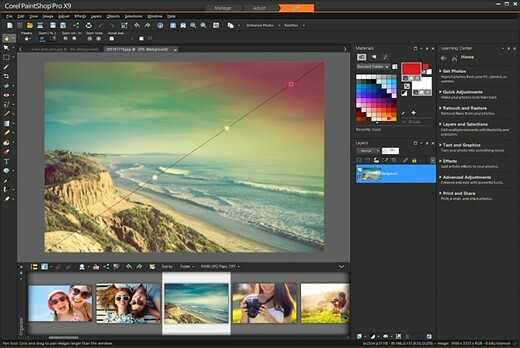 PaintShop Pro X9 Ultimate is also available for $99.99 USD/CAN, 89.99 EUR, £79.99, and $129 AUD. The software is offered in the following languages: English, German, French, Dutch, Italian, Spanish, Russian, Japanese and Traditional Chinese.